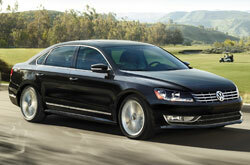 Passat serves up fun family-style! Its commodious back seat, high safety scores, abundant features and available clean-burning diesel make it a "refreshing alternative to the usual mid-sizers," according to The Car Connection's 2015 Volkswagen Passat review. The charm of German engineering is also added to the pot, giving Passat a distinct flavor that's unmatched by competitors. 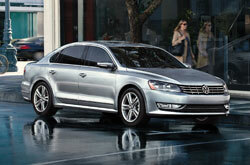 The 2015 VW Passat in Orlando is offered in a variety of trim levels, including: S, Wolfsburg, SE, Sport and SEL Premium. SE and SEL Premium trim levels are also available in TDI variants, which continue to be a hot option because of their excellent fuel economy to power ratio. They continue to be the only diesel-engine models available in the entire midsize class and this year they get an updated engine that delivers a boost in mpg and horsepower! The base engine also gets an exciting update this year, as well. Replacing the previous 2.5-liter is a new 1.8-liter engine. It may be smaller but it's turbocharged, so you'll benefit from greater mpg and torque. Other changes are seen in the cabin, where every 2015 VW Passat in Orlando is now standard with a rear-vision camera, except entry level trims. Additionally, there's a new tech package that combines an infotainment system with the camera. We already mentioned safety above, but it's worth mentioning again and in more detail. 2015 Volkswagen Passat reviews generally never miss noting that Passat exemplifies VW safety. On its Scorecard from U.S. News & World Report, the sedan received a high 9.4 safety rating, a notable factor for families to consider. Passat also received excellent scores in IIHS crash tests, which earned it a 2015 Top Safety Pick title, and the sedan features a long list of occupant protection features, including traction and stability control, antilock disc brakes and the VW Car-Net telematics system. The last comes with functions like automatic crash notification and geofencing, a dream-come-true feature for parents which alerts them when their teens drive out of a set area of the city or pass the speed limit. What are you waiting for? Find your Passat now! The 2015 Honda Accord, Nissan Altima and the Toyota Camry are no match for the 2015 Passat! 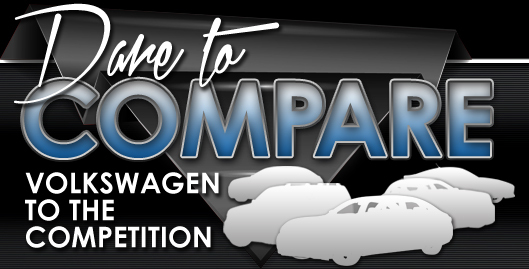 Just compare Volkswagen's latest model against them and you'll see that it outperforms the competition easily. The Passat's unique cabin amenities and bargain sticker price are just a few of the noteworthy qualities that shoppers will be won over by. Compare its price against the forementioned vehicle options and you'll definitely see that it's a phenomenal value, which makes it a number-one choice for many Orlando Volkswagen customers. Look over our bullets for more information! The 2015 Volkswagen Passat review above was penned by David Maus VW South's professional writers; for information about preceding models please view the links in the sidebar. It's our mission to present reviews drafted by the most exceptional automotive writers in the business - it's just one of the things that makes us a reputable Orlando area Volkswagen dealership. Each overview is crammed with worthwhile data, including info about cargo capacity and more - everything you need to make an smart purchasing decision. Not sure if the Passat? is appropriate for you? Check out our online research gallery to read more Volkswagen reviews and to compare David Maus VW South's models to vehicles from other carmakers.